As mentioned in my previous post, I love learning about various languages and cultures. I have not had a lot of opportunities for immersion as of yet, but there are a few very precious times. My first time would have been the trip to the Mexican restaurant that I had with my high school Spanish class. Actually ordering my food in Spanish was a bit of a thrill for the then 18 year old me (this was during my senior year). I have studied Spanish on and off since my high school days. That was back in my home town. 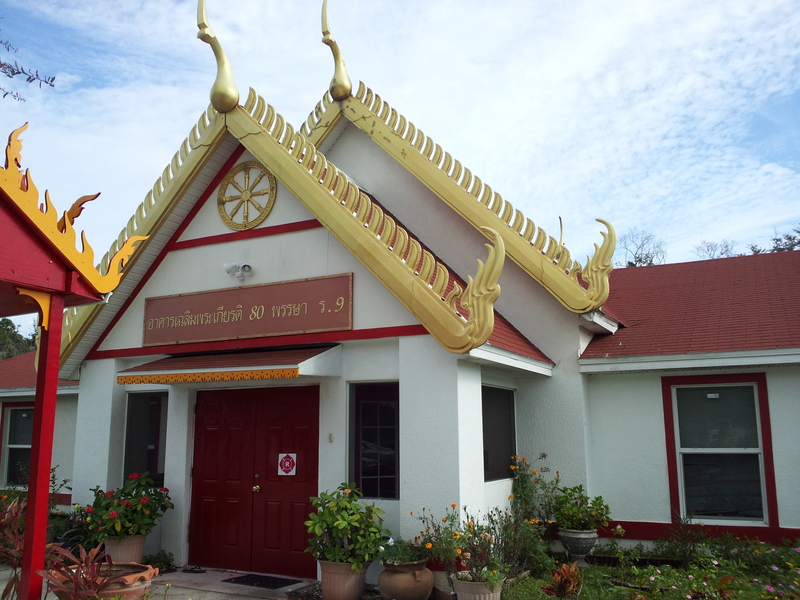 Since moving out on my own to a new state, Florida, I have developed an on again-off again obsession with my local Buddhist Temple. 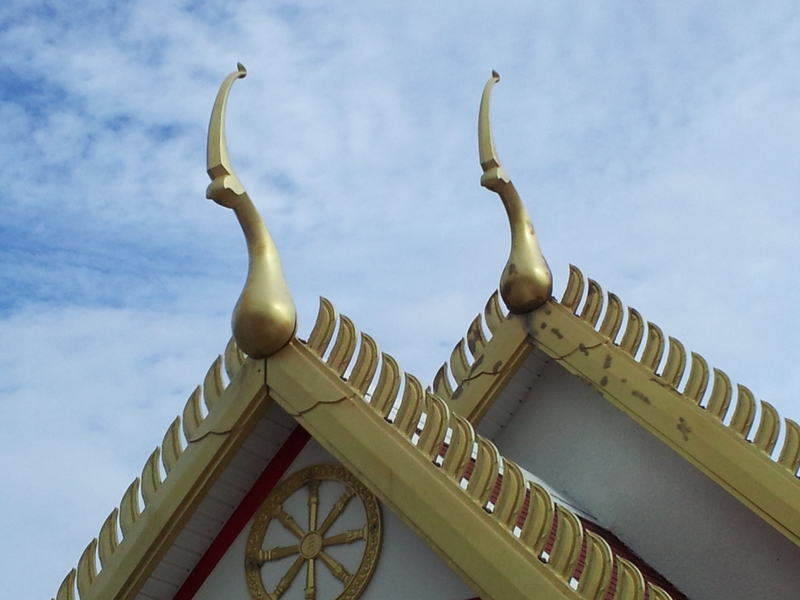 It’s run by Thai monks, and the temple is built according to traditional Thai architecture. On the outside, it is all white except for the roof, which is red. And there are these gold coloured ornamental decorations. I have never asked what they are called and haven’t done a lot of research on them. 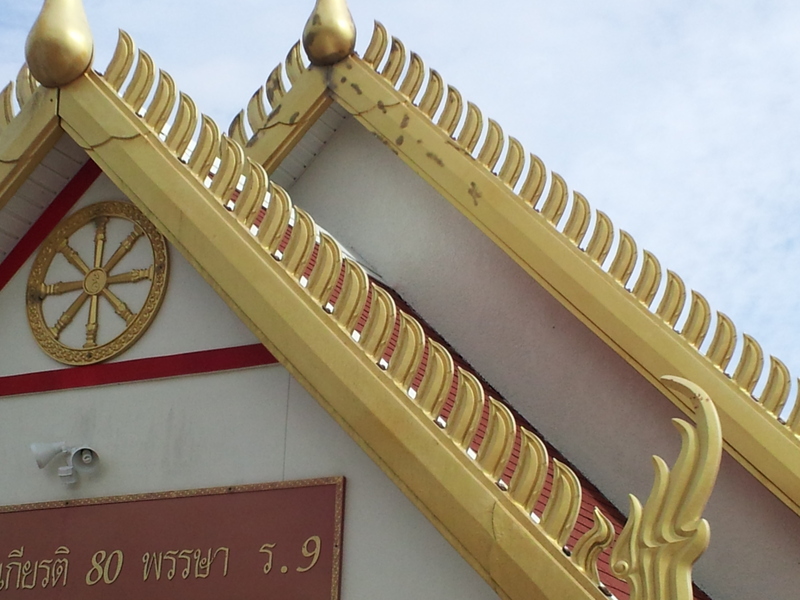 But from what little I have done, I gather that the decorative area on the roof is called the “lamyong”, and the gold coloured ornaments are call “bai raka”. On the inside, there is a kitchen area where food is prepared for the monks (the monks themselves do not do any cooking). And there’s the actual Temple which divides the kitchen area from the living quarters of the monks. The inside of the Temple is equally as impressive, if not, then more so! If you look up at the ceiling, there are similar ornaments attached. I don’t know very much about architecture, I find it fascinating, but I tend to immerse myself in culture and language far more, so I cannot very aptly describe the whole style and visual experience of the temple. But I may say, it is a very humbling experience for a lone westerner such as myself, almost like stepping into Thailand! 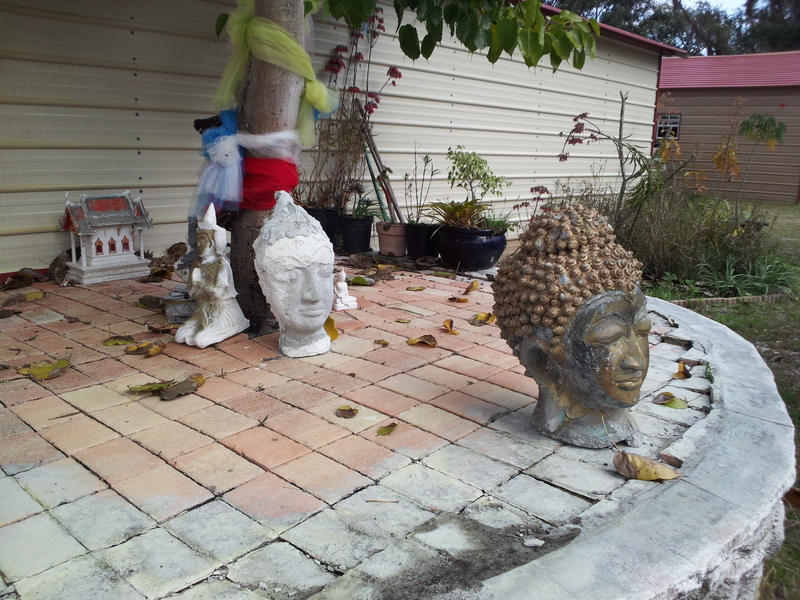 There is a big statue of the Buddha situated opposite the doors leading outside. Facing the Buddha, to the right is the kitchen, and to the left is the living quarters of the monks. During chanting and meditation services, they sit upon an elevated seat that is along that wall (on the left). I have participated in the chanting and meditation several times. The chanting is in the ancient Pali language (which is a language very similar to Sanskrit, and that originally developed in northern India). The first few times I went, I got lost in the text very easily and could bearly pronounce any of it. Now, I am much better with that, even though, admittedly, I still do not understand very much of it. 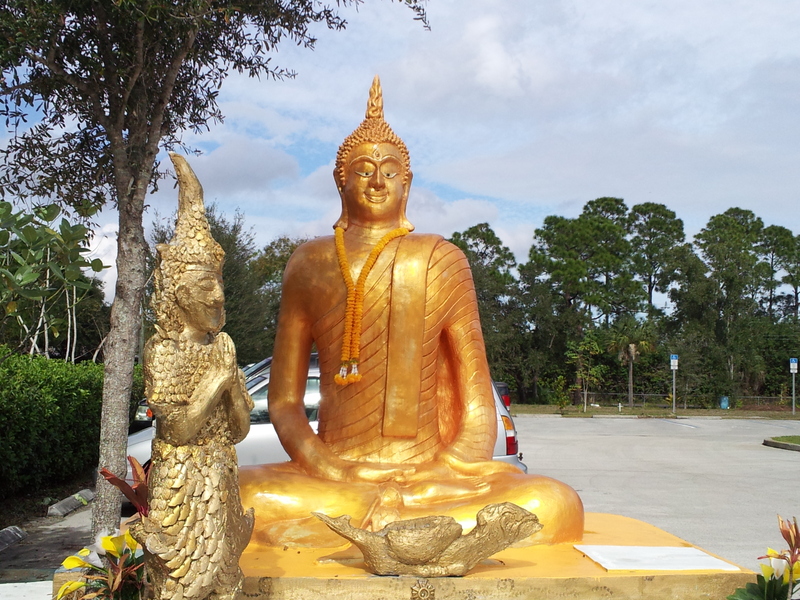 Another Buddha statue that sits just outside the Temple in the parking lot. The chanting is the most beautiful and peaceful thing I have every experienced. It is all done in unison (of course), and the pronunciation, the way the words flow together, the great musical unison of voices, voices chanting in an ancient language – the whole experience brings about an intense feeling of peacefulness. It goes on for about half an hour, and then the lights are dimmed, and we all sink into silent meditation for another half hour. All worries from the secular world are left behind, all there is is this body, this breath, and this moment. All of reality merges into a single moment. The need of clinging is gone, for a short time at least. The time directly proceeding the meditation, I must say, has been my happiest of moments. The intense peace is still there. It’s almost like waking from a sleep that has completely rejuvenated us. The monks and everyone there are always very nice and they very patiently have guided me in their customs and rituals, training me to observe their culture. One must always sit lower than a monk, one must always bow before departing from the presence of a monk, and one must always bow when giving something to a monk or receiving something. Upon my first ever visit, after the morning chanting and meditation, I was allowed to participate in the ritual offering of food to the monks. One of the other laymen said to me, “I will train you”. And he commenced showing me to proper traditional ritual to offer the food unto the monks. I did as he did: got down on my knees with the tray of food, and moved up to the monks (who were upon an elevated seat, of course) and offered each item to them. And then, as instructed I did a bow, and then moved away and stood up again. (Note: I’ve tried on a few occasions to find some textual reference to this word, but I have not been successful as of yet. So, as a result, I am not aware of its proper spelling. So, for the purpose of this blog, I have spelled it phonetically, separating each syllable. If anyone finds any error in what is writ herein, please feel free to correct me, I would be most appreciative). I had read about Buddhism for a few years before ever coming to the Temple, but actually going to the temple and immersing myself in the culture is miles away from merely reading about it! The people I’ve met there are amongst the most accepting and loving that I have ever met. An elderly nun, who bearly speaks any English, once said to me, “I no speak much English… But I love you!” I have no interest in becoming a monk myself, but these are experiences that I shall cherish for a life time!